Natalie qualified as a Solicitor in September 2017. Having been brought up in Carmarthen, she attended Queen Elizabeth High School before graduating from Cardiff University in 2012 with an Upper Second Class Honours in Law. Natalie then went on to complete the Legal Practice Course (LPC) in Cardiff Law School in 2013, where she achieved a Distinction and was awarded the Edgar Buck Prize for best overall performance. During the LPC, Natalie volunteered with the Personal Support Unit in the Cardiff Civil Justice Centre, providing practical information and emotional support to those facing civil court proceedings without legal representation. 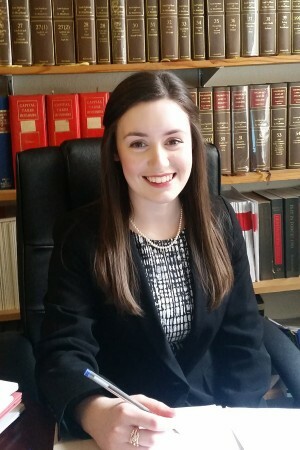 Following university, Natalie joined Pembrokeshire County Council as a Legal Clerk in the Child Care Legal Department, preparing legal documentation and obtaining vast court experience. She then worked as a Paralegal in Carmarthenshire County Council’s Child Care Legal Department, gaining further experience in this field. Outside of work, Natalie enjoys playing both the piano and flute.